This is by far one of the best tasting and easily mixed proteins I've ever had and I feel like I'm actually recovering properly and completely when I drink NFP Protein! Mixes great. Taste great with water or even better with almond milk and dry peanut butter. I order this along with the vanilla twice a month. I love it and the company. Taste great mixes well, taste great with water but even better with milk and a teaspoon of peanutbutter. I had been using the vanilla for the last couple years, and I loved it - but then this came along and now I'm in heaven! NFP whey is the best! It shakes so easy, it's smooth never chalky like most of the others, no aftertaste, and it's not chock full of sugar like most other whey. I had a hard time getting to my goals and was shocked when I started paying attention to the amount of carbs/sugars in other whey! I absolutely love this. I have tried many different protein mixes over many years. Some outrageously priced chain store brands and also ultra cheap brands. This mixes really well, tastes great but the main reason I really recommend it is because it works. I have been using it after workouts for about 4 months. Strength and muscle tone has noticeably improved. The properties of this protein complex are far better than any of the others and the price is about 40% less than the last mix I used. I'm in my mid 50's , looking to stay toned and in shape and this stuff makes a huge difference for me. That and these people are personable and very helpful. I've tried so many protein shakes and this is honestly the best one!!! 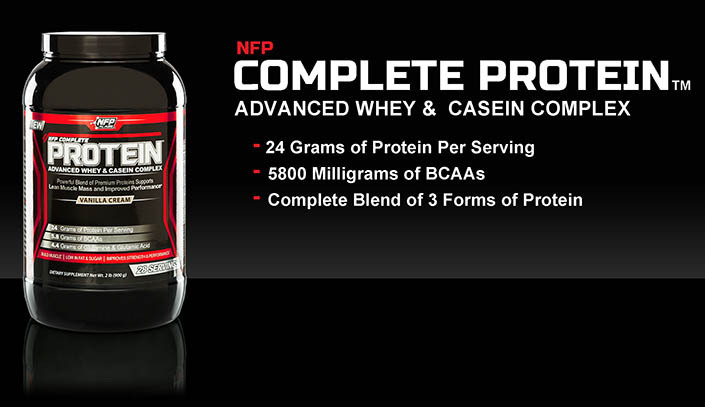 Ok, for those of you who are not sure if you want to try NFP products maybe I can help you with that. I have been using their products going on a year now, but since I am talking about this particular product it has been truly, by far one of the best protein products that I have found on the market today. I have not only gained lean muscle mass but it also has helped improve my performance and strength by 80% so far. Before I used to hit the gym and take other protein drinks, only to feel bloated 30 minutes later. With the NFP complete protein, I feel none of that. This protein blend is a clean based protein drink with no extra added junk that my body, or my muscles need, that's why I know that their products are the real deal. With that said, a person still needs to incorporate a proper diet in order to get the full results so the protein can do the job it's suppose to do. I love both the vanilla and chocolate and I am torn between which flavor because they nailed the flavor of both. Try their products and I am sure you would see results just as I have. I rated this a 5 because I have also tried their other products and it has given me nothing but great results. I am in love with this chocolate protein, by FAR the best tasting around! On it's own or mixed with an individual coffee packet, iced coffee house mocha at home without the carbs and ALL the protein!!! If you have ever wondered what chocolately protein heaven tested like, you have found. Great taste, mixes well, add peanut butter and you'll loose your mind. This is by far the best tasting chocolate protein I have ever had! NFP has done it once again. Love the products!!!! Keep up the good work.